It wasn’t the punch-in-the-gut reaction that might have been felt if editorial operations had been merged or shut down, but newsroom staffers were hardly pleased by the email they received Tuesday from Sun-Times Media CEO Jeremy Halbreich. 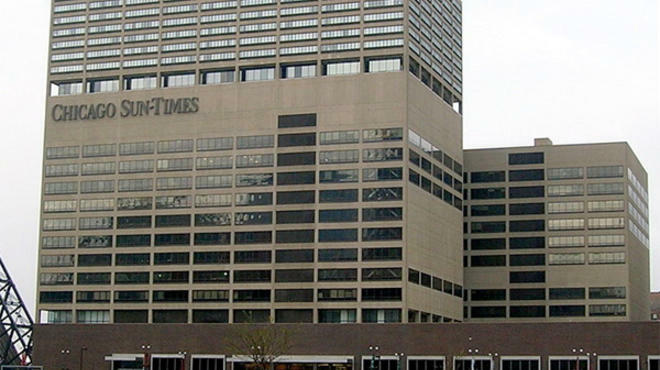 The Chicago Sun-Times and seven of its sister publications will soon be printed by the Chicago Tribune. The move is expected to save the company $10 million a year by closing its Ashland Avenue printing plant and eliminating 400 jobs. “Exiting the newspaper production and distribution business is a sound and prudent decision that will help us ensure a bright future for our business and our newspapers,” Halbreich said in a statement. The Tribune has been distributing the Sun-Times since 2007. And somewhere Marshall Field III is weeping. The man who launched the 24-hour cable news channel CLTV and for a time was interim publisher of the Chicago Tribune is out after 36 years at Tribune Co. Bob Gremillion (pictured right) was one of four executives whose positions were eliminated Monday in a major restructuring by Tribune Co. CEO Eddy Hartenstein. Gremillion, 57, most recently was executive vice president of Tribune Publishing, overseeing six of the company’s newspapers. In 1992 he put CLTV on the air and served more than five years as its president and general manager. According to his online profile, he’s begun working as an independent media consultant in Ft. Lauderdale, Florida. It’s no joke: Steve Dahl really was offered a weekend gig at WLS-AM (890), the Citadel Broadcasting news/talk station. It happened Tuesday while Dahl was filling in for Richard Roeper as Roe Conn’s afternoon co-host. During a break in the hilarity, operations director Drew Hayes (with whom Dahl worked at the former WCKG) seriously broached the subject of a weekend show. Although Dahl laughed it off, the door remains open. Fans of the Chicago radio legend recall he did some of his most memorable work at WLS from 1981 to 1986. For now, Dahl is focused on the August 1 launch of his podcast subscription plan. WLS continues to button up its weekday programming in anticipation of the station’s sale to Cumulus Media — and ahead of coming competition from Merlin Media’s 101.1 FM. In addition to the promotion last week of Bruce Wolf and Dan Proft as replacements for Cisco Cotto from 9 to 11am, WLS also adjusted its news lineup. Starting Monday, Dave Stewart officially steps up to midday news anchor. Stewart landed at WLS in 2010 after a 28-year run at Tribune-owned news/talk WGN-AM (720). Monica DeSantis shifts to evening news duties at WLS. Fox News is about to lose its main man in Chicago. Todd Ciganek told staffers he’s stepping down as Midwest bureau chief to accept a position at a private company. Before joining Fox News, Ciganek worked as an assignment editor at WFTS-TV in Tampa, Florida. Monifa Thomas, one of the Sun-Times’ most promising young reporters, is recovering from a stroke she suffered at home earlier this month. She was found unconscious by a co-worker when she didn’t show up for work. Thomas, 30, who’s been covering the health beat for the Sun-Times, joined the paper in 2005 after receiving a master’s degree from the Medill School of Journalism at Northwestern University.